Her name was Margaretha Zelle and she was born in the Netherlands to a Japanese mother and a Dutch father. Her father made hats for a living and sent her off to be educated at exclusive schools. had her educated at provided her with a was able to provide her with a great education. In 1889, when she was 13 years old, her family fell on hard times. Her father went bankrupt and her mother died two years later. Her father then remarried and Margaretha went to live with a godfather. She entered into training to become a kindergarten teacher, but when she was caught flirting with her headmaster, her godfather pulled her out of the school. Matters deteriorated and she soon fled to the Hague. That's when she saw an ad in a newspaper that would change her life. Dutch Colonial Army Captain Rudolf MacLeod who lived in Indonesia was seeking a wife. He was the son of a Captain and a Baroness, and twenty years older. Nevertheless, she responded to the ad and they were later married in Amsterdam, thrusting Margaretha into the echelons of the Dutch noble class. They moved to Java and Margaretha bore her husband two children. But all was not well in paradise. The captain was a raging alcoholic who abused her and beat her at every opportunity, blaming her for his failings. And he kept a concubine on the side. Their relationship was on again / off again. 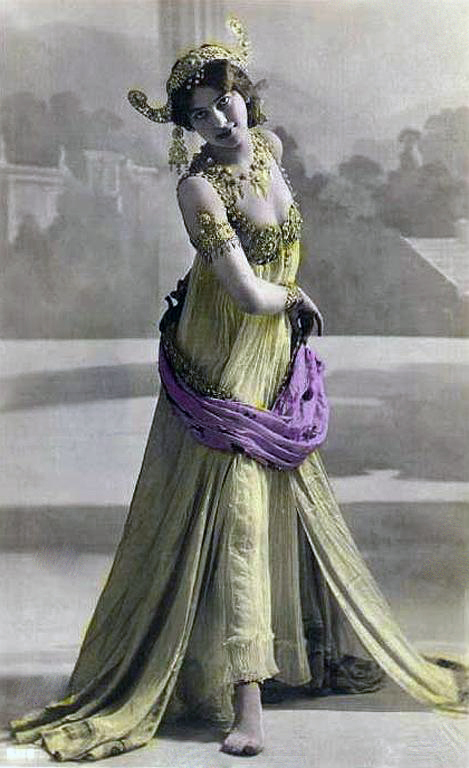 In between she took dancing lessons and adopted the name Mata Hari. But the Captain continued to abuse her. Things really fell apart when their children contracted syphillis via mom and dad. Their daughter survived, but their son died. Some blamed the death on poison by a servant, but it was never verifed. The death was the death blow to their marriage. They divorced and Margaretha gained custody of their daughter. The Captain failed to pay the court ordered alimony and child support, and Margaretha struggled to support herself and her daughter. One day, after the Captain visited the child, he failed to return her to Margaretha who, unable to fight, accepted the loss of her child to her husband. Margaretha moved to Paris where she worked as a circus horse rider, an artist's model, and exotic dancer. She was the queen of flirtation, which led to promiscuousness. She shed her inhibitations like an unnecessary skin and pushed the limits when dancing. Her attraction for men in uniform led her from one affair to another. She invented a colorful history for herself and danced for audiences with her heart and soul. She made herself famous. World War I was beginning, and Mata Hari took up with a handsome Russian pilot, whom she fell in love with. Unfortunately, he was shot down and hospitalized. The French authorities refused to allow her to see him unless she spied on the Germans for them. Reluctantly, she agreed. Of course, matters backfied and she was caught and imprisoned. Sadly, she was convicted and ordered executed by firing squad on October 15, 1917. She was not tied to the stake and refused a blindfold. She blew a kiss to the gunmen. Rumor has it that she even flashed her breasts to them. She was 41 years old. After the volley of shots rang out, she slowly fell to her knees, her head raised, and without the slightest change of expression on her face. For the fraction of a second it seemed she tottered there, on her knees, gazing directly at those who had taken her life. Then she fell backward, bending at the waist, with her legs doubled up beneath her. A non-commissioned officer then walked up to her body, pulled out his revolver, and shot her in the head to make sure she was dead. The media labelled her a femme fatale, a dangerous, seductive woman who used her sexuality to effortlessly manipulate men, but in reality, she was naïve and easily duped, a victim of men rather than a victimizer. Mata Hari is a fascinating person who many people, especially women, will not like. Not every protaganist has to be liked, and Mata Hari is not a usual type of heroine we find in books. Promiscuous and a notorious flirt, she was a woman who fell on hard circumstances who had no choice but to use her beauty and body to earn a living. She pushed the limits in dance and in chasing and using men for her own benefit. One constancy in the novel was her love and regrets pertaining to her daughter. And this helped humanize her, redeem her a bit in the reader's eyes. The book is perfect length and an easy read. 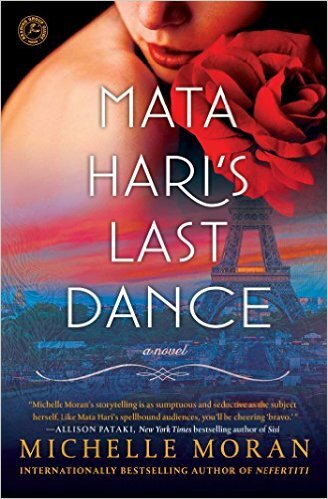 Michelle Moran balances Mata Hari's passions and motivations in a realistic way. I did begin to like her and feel sorry for her and the mess she had made of her life. Of course, the novel did not dwell too heavily on the trial and convinction, but the execution scene was heart-wrenching and poignant. The book left me feeling more like Mata Hari was used as a scapegoat and I did not fully believe she was calculating enough to be such a dangerous spy. I had a sense that politics and cover-ups may have been at play as other readily blamed her to save their own skin. This is an excellent historical biography about a notorious woman of history and left me feeling unconvinced about the hand that fate dealt her. Highly recommended. This sounds a really interesting novel. As a MacLeod I'm fascinated in where clan members have ended up over the centuries - for example the mercenaries who went abroad to fight and ended up in Germany, Poland and Holland. Mata Hari's husband was a descendant of such men - a shame he was such a horror!I've always thought her story would make a great historical saga - but it seems I've been beaten to it! Will enjoy reading it - thanks for recommending.